It probably wasn’t meant to, but Even the Dogs made me feel sorry for the social workers and police trying to deal with the human misery in this story. A man has died one of those squalid deaths we hear about from time to time, and in a scene that we’ve all seen in TV crime dramas, the old cop and the young cop have to break down the door of a trashed flat and deal with the putrefying body. McGregor is economical with the details but we know about the decomposition of the body because the young cop has a handkerchief to his nose and the old cop murmurs sympathetically that he’ll get used to it. The story moves on, but I’m still thinking, what kind of world is this that the police have to get used to this sort of situation so that it becomes routine? Later on, the narrator takes the world to task for walking on past people in need. Lying there waiting for help…is something else we know about. Lying on the ground and looking up and waiting for someone to come along and help. In some kind of trouble. A turned ankle, or a cracked skull or a diabetic epileptic fit or just too drunk to stand up again without some kind of a helping hand. Talk to paramedics who resuscitate the same people over and over again – or try to help just once or twice yourself – and it’s no wonder that otherwise good, kind-hearted people walk around the drunk or drugged on the ground. In my own city I’ve stopped to ask if help is needed only to cop a mouthful of resentful anger and filthy language. I’ve taken beggars claiming to be hungry to a café and bought them both a meal only to have them walk out and leave it, hurling abuse at me because I wouldn’t give them the cash they wanted for a fix. In Edinburgh I gave money to a man crippled by a badly ulcerated leg only to see him saunter down the street with his cheeky girlfriend some hours later. At least when you give money to beggars in Asia you know that it’s not likely to be used on drugs, but these days I want my efforts to help the homeless to be effective so I support the Salvation Army who have the expertise and resources to make a real difference to people really in need. The blurb on the back of this book talks about the ‘underclass we instinctively turn away from’ but the narrative, fractured as it is, tells a fairer truth. Even as he makes excuses for himself and everyone else in this story, the narrator reveals the efforts of many who would like to help. When Louisa spouts promises about making a clean start it is he who dismisses these pathetically good intentions because he’s heard them all before from every druggie he’s ever known. He recognises the phrases she uses because there are careworkers on that estate trying desperately to make a difference and getting no support from the community to do it, certainly not from the people who purport to care about each other. What a thankless, dispiriting job it must be, working in drug rehabilitation! As Even the Dogs reveals, the back story of these apparent losers is often brutally tragic: returned soldiers who can’t cope with the physical and mental legacy of war service; broken families; foster care placements which break down, poverty and hopelessness and so on. Jesus. Give that girl a medal. I’ve seen some customer reviews commenting about the ‘bad editing’: unfinished sentences and missing punctuation. I don’t think it’s bad editing! I think the point about the disjointed narrative and ‘missing’ punctuation is to reveal the fractured way these people live their lives – they don’t get to finish things, there’s nothing settled or routine in their lives and their lives are completely disrupted by the constant need to get a fix. Their conversations trail off into unfinished sentences because nobody’s listening to them so their words just trail away into nothingness. It is a haunting book. I only finished it last night but I keep thinking about the scenes where the ‘gang’ is hanging around inside the mortuary and nobody sees them there even though they come in close, wanting to touch the body. At first I thought this was the author trying to show Robert’s friends imagining what’s happening at the post-mortem, or was perhaps a sort of comment on the voyeurism of TV shows like Silent Witness. Now, however, I think it’s a post-modern technique to make us realise that all the officials dealing with the death and trying to find out what happened have not noticed these ‘invisible’ people from the underclass and so they’ve never bothered to ask them about what they know. At the same time, if the authorities did include them in the investigation and interview them, their evidence wouldn’t be admissible in court because they’ve all got lousy memories because of the drugs and because they can’t express themselves properly. Even the Dogs is not easy reading, but it’s hard to put down once you get started. I’ll be watching out for more from this author. PS Thanks to Alan at GoodReads for helping me to clarify my response to this book. PPS You might like to visit Jon McGregor’s website (with links to various reviews), watch him talk about it on video or read a sample from it (not for the faint-hearted). I was not inclined to read this book and only did so when a couple of readers whom I respect gave it five stars. I was most impressed when I did read it — and I think your review does a very good job of indicating one of its primary strengths, in focusing on the seemingly hopeless task of those who must deal with these characters. 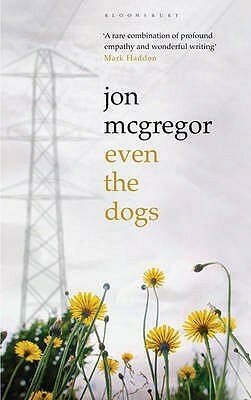 I also think McGregor brings those characters to life in a most interesting way — certainly it is one of the better books that I have read this year, as disturbing as its theme might be. This sounds very heavy indeed. I’ve got copies of his first two novels, but never gotten around to reading them. I have only ever heard good things about them… perhaps it’s time to bump them up the TBR. The surprising thing about this is that it’s not as ‘heavy’ as it might appear to be. Yes, the theme is serious, and yes, the postmodernist construction is going to put some people off, but actually the narrator has a sense of humour and I ended up quite liking him (even though of course I didn’t like his way of life). And I suppose that’s part of McGregor’s point, that people like his characters are still people, and may be very likeable indeed notwthstanding. Yes, I agree. I read your review. ‘Even the Dogs’ also “made me feel sorry for the social workers and police trying to deal with the human misery in this story.” You liked it somewhat better than i did. Using drugs is something for which I just don’t have much empathy. Shows and books about alcohol addiction appeal to me more, because I can see how that happens. Gambling is another thing I can’t really understand. Whenver I read something about gambling addiction, I just wonder why they just don’t quit, since I’ve never been tempted. Well, that’s the thing, isn’t it? People know before ever touching drugs that they are addictive (except for rare cases where a drink is spiked, I suppose, but even then, you have to be hanging out with the sort of people that you can expect to be risky). And people also know that they are illegal so the choice to engage means submitting to all the well-known perils of illegal supply. Perhaps I’m lucky, I’ve never needed that kind of a rush so I’ve never been tempted either.